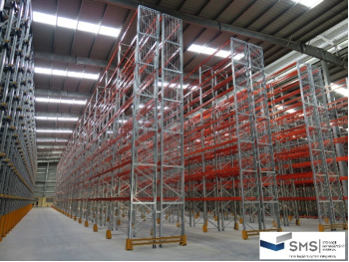 Racking & shelving are ubiquitous elements of most modern warehouses, manufacturing facilities, retail centres and distribution facilities. Storage Management Systems can improve your storage efficiency with high density storage racking or shelving. Various options are available with accessories to suit your application. Static racking is the support you need with standard to heavy duty racking and ranges from roll formed to clip-in to a structural bolt-together configuration. Our Adjustable Pallet Racking (APR) or Conventional Pallet Racking (CPR) are fully adjustable to fit any size warehouse with the maximum of ease. APR allows for the use of counter-balance forklifts, reach trucks or turret trucks in Very Narrow Aisles (VNA). All the components are tested to guarantee strength and durability. Our Live Storage system consists of racking where the platforms, consisting of rollers, are slightly inclined, allowing the palletised goods to move to the front by means of gravity. It is a storage system designed to store materials on pallets. Its high storage density capacity makes it convenient for factories and warehouses. Forklifts can reach heavy loaded pallets with ease. Palletised materials can be stored in horizontal rows with multiple levels. Our Live Storage racking for pallets is also ideal for storing homogeneous pallets, and is suitable for warehouses where both controlling stock turnover and saving space are critical. Gravity Flow: The racking facility has a loading area (highest) and an unloading area on the opposite end of the roller beds. It offers ideal storage for FIFO (first in, first out) racking systems and in cases where stock turnover control is important. Push Back: The racking facility has a single loading/ unloading area. It offers ideal storage for LIFO (last in, first out) systems and in cases where the amount of references prevails over the volume of each reference. In addition, our Live Storage racking for cartons or boxes is a high-density system for storing boxes or light products. It is recommended in cases where both controlling stock turnover and saving space are critical. Unit loads slide on slightly tilted pulley wheel ways at the different levels of lanes. These ways can be easily adapted in the cross direction to accommodate different unit loads. This system increases picking rates. 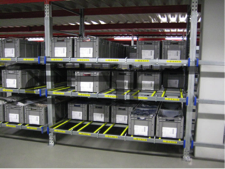 Our system offers multiple levels, each containing racking or shelving. 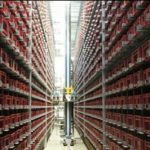 The Multi-Tier racking system is the optimal solution for manual storage where available space is limited. Therefore, this storage system is selective, as it allows immediate access to all unit loads and/or references stored; and versatile, given its adaptability to any type of unit load. 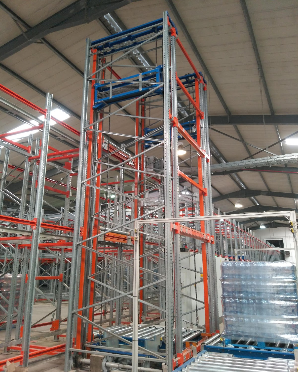 This storage system provides excellent maximisation of height by creating different aisle load levels, which are accessed by means of stairs. 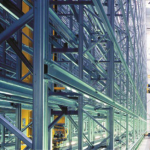 Our Longspan racking system is the optimal system for manually storing small to medium-size products. The range of accessories and possible system configurations allow it to be adapted to any type of goods. Although it is a hand loaded system, it utilises the full height of the facility, since higher levels can be accessed using mechanical means (S/R cranes or order-picking trucks) or through walkways located inside the system. Our temporary stand-alone structures allow for a double floor area by creating an extra platform. Mezzanines use a variety of accessories, such as railings, stairs, pallet unloading points, and more. Mezzanine floors can be assembled using different materials, such as wood and tramex. The mezzanine system is the ideal solution to allow maximum utilisation of building height, multiplying its effective surface. This storage system mainly consists of a base, a column and overshooting arms. Our Cantilever system allows levels to be located on one or both sides of the column. It offers an efficient and economical option for the storage of long, volume loads in bulk, especially designed for slow moving goods. This makes our Cantilver racking system ideal for the storage of furniture, tubes, timber, steel frames and other heavy loads. Side loaders or 4-way trucks can be used with this system. It is strong, versatile and adaptable. It is also great option when your company is looking for future expansion. From light to heavy duty shelving for storing documentation, parts, materials and stock. Galvanised – durable, hardwearing for harsh environments. 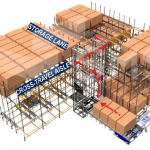 Rack clad warehouses are any type of storage systems in which the racking is part of the building structure, thereby avoiding the need for the structural support work of a conventional building. For this type of warehouse, the racking not only supports the load of the stored goods, but also the load of the building envelope, as well as external elements, such as wind and snow. Most Rack Clad Buildings are automatic systems using robotic equipment for handling loads. The rack clad or rack supported building are composed of either structural steel sections or roll-formed pallet racking. 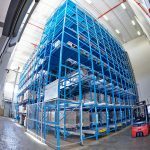 There are several types of Automated Storage & Retrieval Systems (AS/RS) called Unit-load AS/RS, Mini-load AS/RS, Mid-Load AS/RS, Vertical Lift Modules (VLMs) and Vertical Carousels. These systems can either be stand-alone units or in integrated workstations called pods or systems. Usually these units are integrated with various types of pick to light systems and use either a microprocessor controller for basic usage or inventory management software. Maximising space utilization are the greatest advantage of these systems where space utilization can be increased by up to 90%, productivity levels by 90%, accuracy to 99.9%, levels and throughput up to 1000 lines per hour/per operator or more depending on the configuration of the system. With more than 17 years’ experience with development and continuous improvement of our Pallet Mole™, Storage Management Systems has the solution with the latest technology in compact, high density vertical storage, to maximize the use of floor area and warehouse capacity. 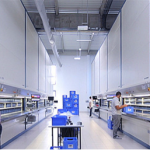 SMS has developed an innovative, high density storage system to meet various storage demands. The Pallet Mole™ Deep Lane Storage System, our flagship solution, enables “aisle free” racking to provide a much higher density of storage than Drive-in racking, Double deep storage and conventional All Purpose Racking / Adjustable Pallet Racking (APR) or Very Narrow Aisle (VNA) storage. It is also ideal for freezer applications, where the more compact the goods are stacked, the better the efficiency and ease of temperature control. The Pallet Mole™ can operate in an environment of up to -30˚C / -22˚F. Proven track record that our Pallet Mole™ are used all over the world. Powered by on-board rechargeable batteries, the Pallet MoleTM is driven on rails, into a specially designed racking system of tunnels. Using the lifting platform and positioning sensors, each load is then transported to the furthest available storage location in the tunnel. Storage and retrieval are both conveniently operated by the forklift truck driver using a remote control. 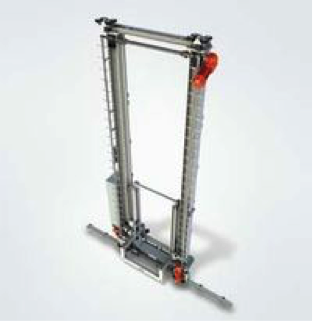 Electro-Mechanical Lifting & Traction System – Reduces maintenance costs and downtime. The MMS monitors, controls and records information pertaining to Pallet Mole™ units. The system is a “ Lite “ version of our full “Control-IT” warehouse control system (WCS). This system monitors all Pallet Mole™ units, within the warehouse in a user friendly manner that is easy to navigate, simple to access and incredibly informative. The data is always available to the client and therefore can be used by internal data analytics teams to illustrate working hour statistics, operational statistics, power consumption and even pro-active, automated service notification. This simple openness of data allows us to work with the customer to achieve the desired goals of the facility. The MMS can always operate as a standalone application but if required, also integrates seamlessly with our warehouse management system (WMS) called Track-IT™. Our Fully Automated Pallet Mole System (FAM) is a new flexible innovation in bulk storage which is ideal for high volume/low SKU palletised loads. The system, being a cart-based Automated Storage and Retrieval System (ASRS), provides the capability for high, scalable throughput. Comprising of simple components, the FAM system provides the highest density storage together with throughput flexibility in the world. Storage Management Systems believes in ‘the beauty in simplicity’. FAM system operates in two modes, depending on pallet through-put requirements. High Pallet through-put requirement - In this scenario, Vertical Transfer Units (VTU’s) are used to transfer Pallets only to various storage levels. 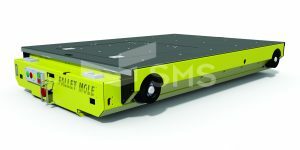 Dedicated Mole Transfer Carts (MTC’s) and Pallet MoleTM units are assigned per storage level. Low pallet through-put requirement - In this scenario, Vertical Transfer Units (VTU’s) are used to transfer Pallet MoleTM units and/or Pallets, together with Mole Transfer Carts (MTC’s) between various storage levels. At the heart of any efficient logistic solution, be it Manual, Semi-Automated or Fully Automated, lies intelligent software. Storage Management Systems’ WCS & WMS software, in conjunction with our FAM storage solution ensures optimum performance. The modular software is a perfectly adapted one-stop solution. MHE movement speed All MHE travels at 1m/s when fully loaded and 1.25m/s when empty. This is done to safely reduce cycle times. MHE weight bearing Maximum pallet loads of 1,500kgs can be handled. Heavier loads can be handled with customised MHE design. 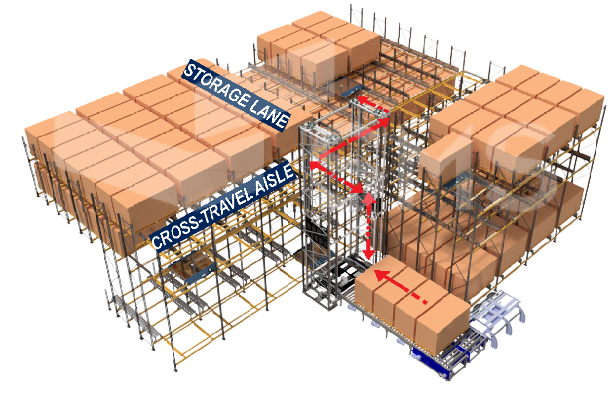 Modular design The system is designed in a modular way to allow for sections to simply be added on in future extensions of a warehouse. Quickly constructible and de-constructible As opposed to other AS/RS systems, FAM systems are quick to assemble and dissemble which allows them to be moved within warehouses or from and to facilities as required. Complete/partial automation options The FAM system can be placed into a system directly after an industrial fabrication process. This allows a fully automated system from raw materials to palletised products and lastly distribution. Alternatively, the FAM system can be configured to accept pallets manually by fork-truck operators, etc. Traceability of items Full traceability of stock through barcodes / RFID tags allows FAM systems to offer security of stock. Perpetual stock count The FAM system does its own “housekeeping” when the system is not in use / undergoing minimal usage, it performs an automatic, perpetual stock count of pallets in the system. It ensures that the stock within the database matches the stock within the system. It flags any differences. Simple user interface The user interface is designed to be easy-to-use, offer a powerful, “Dash-board system overview”, depicting the amount of data visually/graphically. ERP integration The FAM system offers full integration with any existing ERP system. Integration is via simple, pre-defined data tables in a common database, shared between “Track-IT” WMS and customer ERP system. 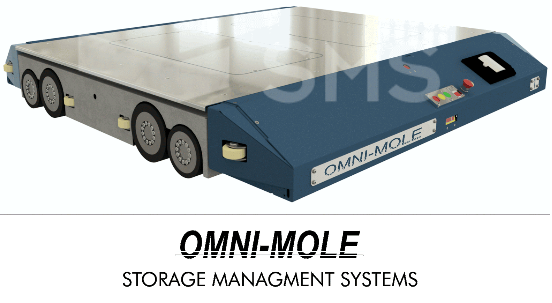 The Omni-Mole system is a bi-directional, cart-based, high-density, deep lane storage, palletised load, lift & run system, which provides flexible throughput together with ultimate scalability. The Omni-Mole is the next generation of our well-established, reliable Pallet Mole™ platform. The solution realises shuttle translation on a 2-dimensional plane as opposed to a 1-dimensional line, achieved by the Pallet Mole™. Vertical transfer of pallets are achieved through our vertical transfer unit (VTU), allowing pallets to reach any location, within a multi-level, high-density racking system. The solution is crisp and allows for expansion through interfacing conveyors and automated guided vehicles (AGV’s). The principle is simple – The applications are brilliant! The compact design of the Hänel Rotomat® enables up to 60% more storage area to be created on a minimal footprint by making use of the available room height. The operating principle The Hänel Rotomat® creates an enormous amount of storage space on a small footprint. It works on the Ferris wheel principle, i. e. the archives come to the operator, not the operator to the archives. The structural design Self-supporting steel plate casing, comparable to the cellular structure used in the aircraft industry. Lockable, smooth-action sliding doors. Environmentally friendly powder coating, as well as impact-resistant and shock-proof stove enamel finishes. There are five attractive colors to choose from. Customized finishes are possible. The drive system Most Hänel Rotomat® storage carousels are powered by two 400-V three-phase motors. Pole-switching three-phase motors are used as standard, enabling gentle but powerful acceleration and braking even under different load conditions. The intelligent Hänel control systems Powerful Hänel microprocessor control units offer the possibility of hooking up to computers and other peripheral devices, giving you an optimal overview at all times. The safety Hänel ensures maximum safety by using the Hänel safety threshold switches and light-barrier curtains compliant with DIN EN 15095. The Hänel Rotomat® carousels have the German GS mark and the Swiss SUVA inspection certificate attesting to their safety. 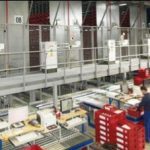 The automated ‘high-bay warehouse in a cabinet’ The Hänel Lean-Lift® is both storage rationalization and goods protection in one: At the center of this closed system is a computer-controlled positioning lift – the ‘extractor’. In front of it and behind it are the storage shelves. This is where the articles are stored in containers in height optimized positions. The storage locations are accessed automatically under electronic control by means of the extractor, which stores or retrieves the requested container. The goods are then delivered to the retrieval area at the correct ergonomic height. This ingenious principle finds applications in a wide variety of industries. Used in the medical technology and electrical engineer­ing sectors (for which ESD versions are possible) and also in the automotive, aircraft and pharmaceutical industries or in mechanical engineering, the mail-order and wholesale trades – the Lean-Lift® is the ideal buffer, dispatch, production or tool store, to name but a few sectors that demonstrate its versatility. Maximum Flexibility With the rollout of the Multi-Space®, Hänel optimizes the principle of 3-axis storage systems. In addition to the many benefits of Hänel’s Lean-Lift® technology, the Hänel Multi-Space® offers maximum flexibility, speed, and space utilization. Thanks to its cutting-edge technology, Hänel is able to offer a 3-axis storage system that is over 9 m wide. The Hänel Multi-Space® can even vary its width and height to meet later needs – a new feature from Hänel! Even the number of access points is variable and can be altered at any time. Along with the different container widths and depths, this results in the most versatile of combination possibilities. A wide range of boxes and compartment divisions enable orderly, space-saving storage of small parts Optimum space utilization The variable positioning of the access openings makes optimal integration into already existing storerooms possible. Previously inaccessible areas can be integrated into a storage concept without difficulty. And the Hänel slot profile combined with the Hanel multifunction containers are the ideal prerequisites for compact, heightoptimized storage. Time saved No waiting – one operator can perform order picking at two access points! At units with two access openings, users can retrieve at one and store at the other simultaneously! The right decision If you want to improve your intralogistics concept and reduce costs, you should talk to the specialists at Hänel first to work with you to develop your own ‘tailor-made intralogistics concept’. Designed to maximum safety standards, the Mini-Load system have an inherent bending resistant single mast design which stores & picks individual loads from bays within the racks to provide high productivity picking. Once a load has been picked, it will be delivered to the output bay. This system is ideal for handling of lightweight or small loads. Notably, all structural elements, even the switch cabinet, can be reached without a ladder or platform. The systems’ low-wear bearing with Vulkolan and polyamide rollers assures an extremely low noise level when running. The single-sided layout of the systems especially allows for service and adjustment work to take place within the confines of narrow aisles. 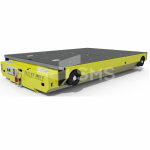 Designed for expedited handling of cartons, totes or trays in high throughput environments, SMS offers its clients various One Level Shuttle (OLS) single and double deep load handling devices. This shuttle has a two-dimensional movement (along aisle and into storage) while storing and retrieving items at multiple depths on a shelf. The devices are also furnished with on board vehicle controls and Wi-Fi data transmission. The devices are used for high dynamics as well as extendibility. With increased SKU numbers today and growing markets such as e-commerce, with the demand for just-in-time ordering, workforce consistency and availability have become less predictable. Therefor embracing the Goods-to-man approach using this type of technology minimizes wasted time between picks increasing the number of orders processed per person. Sequence buffering between operations with disparate timing. Reordering input and output to improve upstream productivity while meeting downstream demands. Feeding unit sortation induction stations. Sorting, staging and accumulating as a conveyor replacement. High availability and reliability due to modular design and scalable architecture. Ability to redundantly store inventory and spread transactions to allow for complete failover safeguards. 220-pound / 100 KG load handling capability. Low energy consumption due to run on demand design and low weight. Storage and retrieval cranes are used to store unit loads or pallets in high bay warehouses at a height of up to 24 m. This technology type is also used for automatic loading and unloading of flow rack systems. Produced in the proven two mast technology, this crane contains a multi-material mixture of composite, steel and aluminium, resulting in a mammoth 60 percent reduction in weight when compared to older designs. The result is a stiff and reliable structure that meets even the highest requirements. Telescopic forks are used as load handling device (LHD). Used for multiple-depth storage as usual in channel warehouses. The mast in the crane’s framework-construction provides the necessary stability and strength required, no vibrations and a proven low centre of gravity for the whole system. Stateof- the-art camera systems for efficient troubleshooting and increase of the operating comfort may avoid accessing the ASRS machine for fault finding. These machines can also be equipped with state-of-the-art energy saving technology on request. This comprises an active coordination of the running axis to achieve energy-optimised running profiles. In addition an optional energy recovery system is available, e.g. to recover excess brake energy and feed into the supply grid instead of emitting it as heat through the brake resistors. Energy-efficient high-bay warehouses also require optimisation of the overall system.